A wide range of charts generated using data from Numerical Weather Prediction (NWP) computer models is available on TheWeatherOutlook. NWP uses mathematical models of the atmosphere and oceans to predict the future weather based on current conditions. In the era of digital computers it has become the key tool used in weather forecasting. NWP models can be global or regional. Regional models often look no more than 3 days ahead and are designed to give a detailed picture of the short term prospects. Global medium range models look several weeks ahead and seasonal models look months into the future. Forecast accuracy generally drops away quite quickly after about 5 to 7 days ahead. 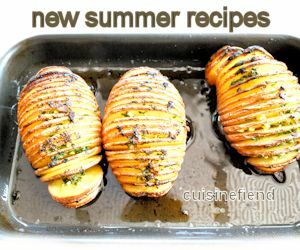 Seasonal models are quite new and they offer a low level of accuracy for the UK because of its close proximity to different air masses. Ultra high resolution (0.01° x 0.01°) model run by Meteo France. Covers most of Europe. 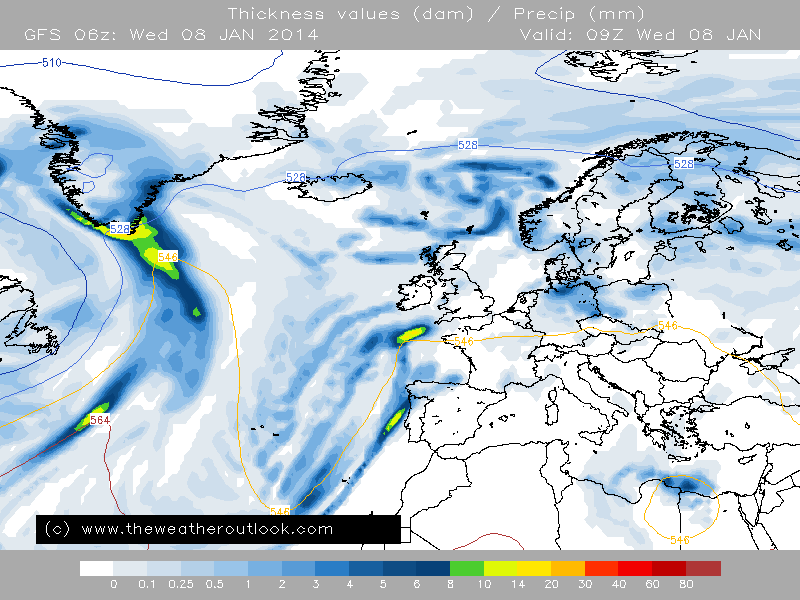 High resolution model (0.1° x 0.1°) run by Meteo France. Forecast charts are stepped at 1 hour intervals and provide a comprehensive view of the weather prospects for up to 102 ahead. High resolution model (0:0625° x 0:0625°) run by Deutscher Wetterdienst (DWD). Plots on TWO are currently stepped at 3 hour intervals but DWD also provides data sets stepped at 1 hour intervals. A high resolution model updated twice each day providing forecast data up to 48 hours ahead. Stepped at 3 hour intervals. Model not currently available on TWO. A global model (horizontal resolution approximately 0.25° x 0.25°) updated four times each day providing forecast data up to 384 hours ahead. The first 240 hours are stepped at 3 hour intervals with the rest at 12 hour intervals. A global ensemble forecasting system based on the GFS model. It updates four times each day and provides data for up to 384 hours ahead. 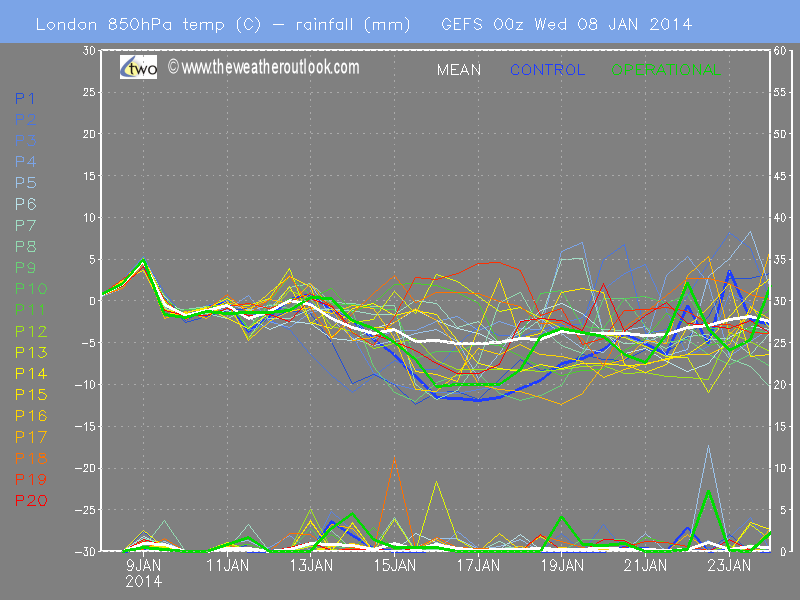 The GEFS consists of 20 members plus the operational GFS and the control run. The runs use slightly different initial atmospheric conditions that are all plausible given the past and current set of observations or measurements. They are an attempt to account for uncertainty with the aim being for the outcome to fall within the predicted ensemble spread. A bigger spread means more uncertainty and lower forecast confidence. A global model run at a horizontal resolution of 0.1° x 0.1°. It is updated twice each day and provides forecast data for up to 240 hours ahead. This is widely considered the best global NWP model currently available. The Global Environmental Multiscale Model (GEM) runs at a horizontal resolution of 0.24° x 0.24°. It is updated twice each day. A global model run at a horizontal resolution of 0.234° x 0.153°. It is updated twice each day. Hand drawn charts provided by the UK Met Office. A global model updating four times each day providing forecast data on wave heights and periods. Charts for the North Atlantic region are available. The models output a range of weather forecast variables at different time steps that can be plotted as charts or graphs to produce a visual representation. For example, maximum temperature, 850hPa temperature, mean surface level pressure and wind gust speed are examples of variables. Time steps may by +3, +6, +9...+X hours ahead. Many of the charts on the site are easy to understand, for example maximum temperature, cloud cover and precipitation rates. Others such as 500hPa GPDM and 850hPa temperatures require some explanation. Information on the more commonly used ones is below. Mean Surface Level Pressure (MSLP) is usually show on the 500hPa GPDM plots with contours. The 500hPa plots are useful for a range of reasons. A key one is that computer models forecast this level better than surface conditions at longer ranges. In the winter months areas of higher heights (yellow, orange and red shading) to the north and east of the UK are often associated with colder weather. Lower heights to the north and east often mean a typical west or southwesterly flow bringing mild and unsettled weather. In the summer months higher heights over the UK are an indicator of drier and warmer weather. 500hPa ridge - trough patterns can be identified on these charts. Rain is more likely under a trough and dry weather under a ridge. MSLP and 500hPa charts are available using different map projections and covering different areas. Ths one below covers the North Atlantic region and Europe. The thick black line shows the 552hPa geopotential height and is shown to make it easy to identify the trough - ridge patterns. This chart shows surface level high pressure areas and upper level ridges to the south of the UK. Areas of lower pressure are to the north. That usually indicates unsettled conditions and close to average temperatures in the winter months. The 850hPa boundary is approximately 1500m above sea level. This means there is no diurnal variation (day to night change due to the surface warming and then cooling) making it very useful to identify air masses. 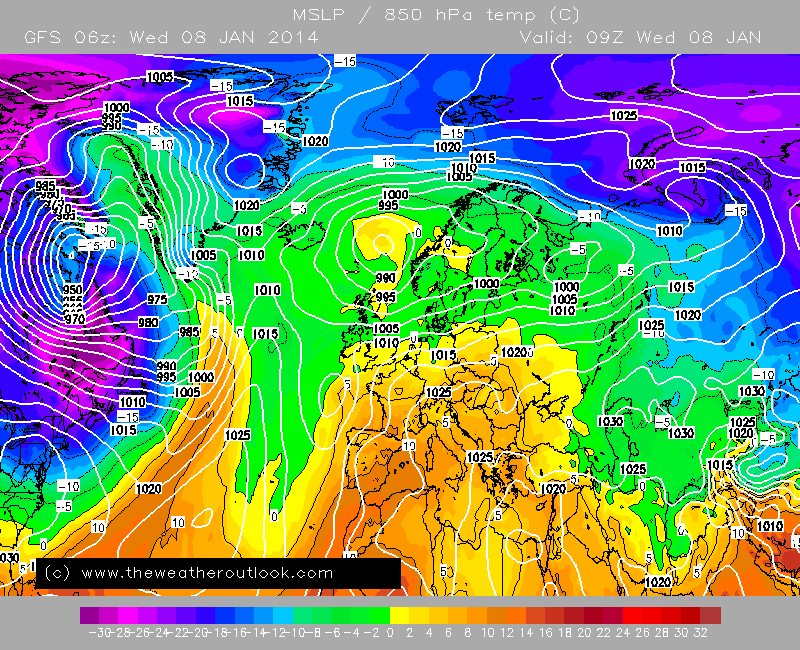 In winter 850hPa temperatures below -5C are often be cold enough for snow. Even when values are just below 0C snow is possible in certain scenarions, usually when the UK is under an easterly or south easterly air stream. In the summer months temperatures at ground level are less dependent on the 850hPa air mass and more dependent on the stronger sun. Thus in summer even if 850hPa temperatures aren't very high it can still be warm..
MSLP and 850hPa temperature charts are available using different map projections and covering different areas. This one covers the North Atlantic region and Europe. Yellow, orange and red shading is used to show temperatures above 0C. Purple, blue and greed shading is used to show temperatures below 0C. On this chart the UK is under an Atlanitc based westerly flow and 850hPa temperatures across the country range from just below 0C to about +3C. Thickness gives an indication of how warm or cold the air is with lower values indicating colder air. Thickness values are one of the parameters used to help determine whether precipitation will fall as snow or rain. If the air is of a continental source snow can fall with thickness values of about 530dam or lower but a maritime source often requires values of 522dam or lower. Thickness value charts are available covering different geographical areas. This one covers the North Atlantic region and also shows forecast precipitation. The 528dam line is far to the north of the UK and close to Iceland. The 546dam line is near the south coast and the 564dam line near the bottom left of the chart to the west of the Azores. Jet streams are ribbons of strong winds moving around the globe. The polar jet front marks the boundary between tropical air masses and polar air masses. 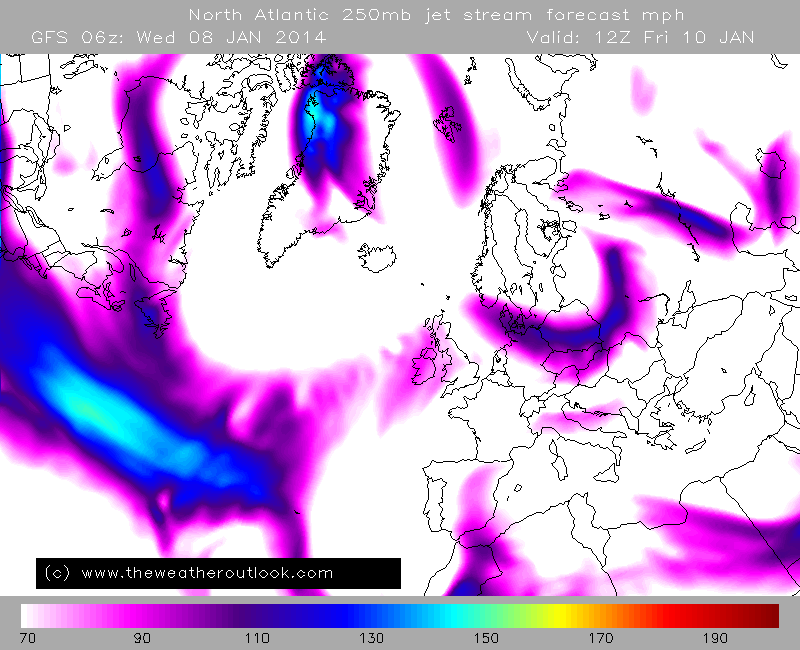 Low pressure areas usually follow a path close to the jet stream. A flat (zonal) jet pattern close to the UK often suggests unsettled conditions with close to average temperatures in the UK. A buckled (meridional) pattern often leads to cold or warm spells as the UK sits to the north or south of the polar jet front. Jet charts are available for the North Atlantic and Europe region, and the northern hemisphere. On this chart the jet stream is shown exiting the eastern coast of the USA and heading across the Atlantic towards the UK, but becoming weaker. As noted above the GEFS consists of 20 individual runs (referred to as perturbations, P1 to P20) plus the control run and the GFS operational run. A convenient way of quickly assessing what all of the perturbations are showing is to plot them together on a line graph. Plots of different variables are available, but the most commonly used one shows 850hPA temperatures and rainfall amounts. This shows forecast 850hPa temperatures on the top half of the plot and rainfall amounts on the lower half for up to 16 days ahead. On the 850hPa temperatures plot in particular look for the lines to be clustered close together. Tighter clustering indicates less spread and a higher degree of confidence in the forecast. 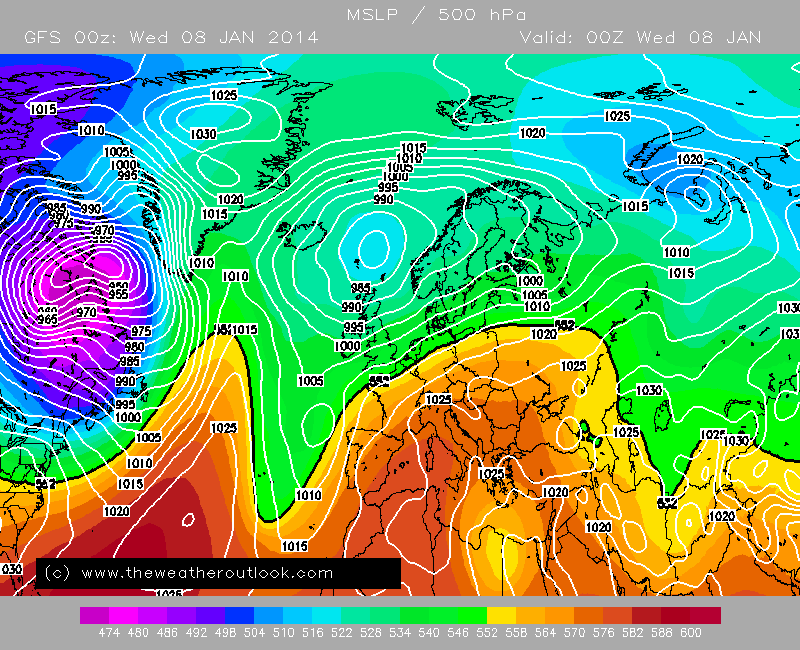 On this plot there is quite a wide spread by Jan 15with 850hPa temperatures ranging from about +5C to -12C. The thick white line shows the average of all runs. The thick green line is the GFS operational run, and the thick blue line the GEFS control run. This guide is intended to be as simple as possible, giving an overview of some of the key charts available on the site. If as a result of this there is something you either don't understand or think is misleading please Contact us via the link near the top of the page.